Back in 1977 twelve characters were immortalized by Kenner as the first Star Wars action figures ever. Needless to say, their popularity was off the charts, and Kenner had a hit on their hands until well into the mid-80s. I consider myself lucky when it comes to Star Wars. I was barely five years old when the first movie came out, the perfect age to fall in love with not only the movie franchise, but the toys that came with it. My friends and I were rabid collectors of Star Wars action figures, and Star Wars dominated our youth. Through the years we chomped at the bit in anticipation of new figure releases. We eagerly mailed our "proofs of purchase" away for special figures. Spotting a new card with a different picture on the back was cause for massive celebration, speculation and excitement. We were more than willing to accompany our mothers on long, boring shopping outings if it meant getting a peek at the Star Wars display, and possibly snagging a figure we'd been searching for. Of course to be the first one to grab an elusive figure meant a major boost in neighborhood social status, as far as Star Wars was concerned anyway. Our Star Wars action figure madness continued through the release of The Empire Strikes Back in 1980, and Return of the Jedi in 1983. 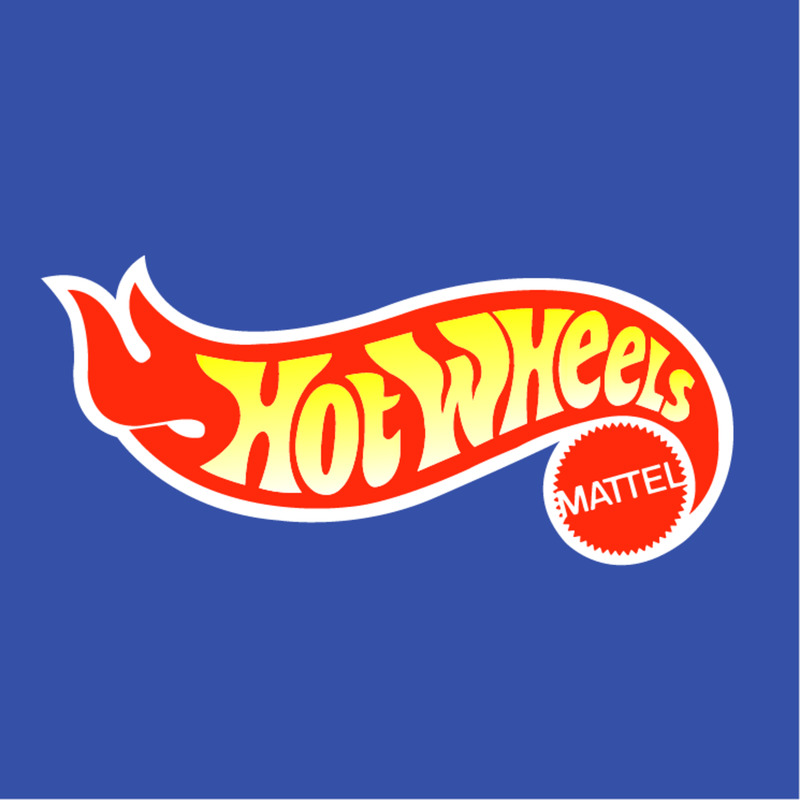 Kenner pushed the envelope with new figures, new designs and innovative vehicles and playsets. We couldn't get enough of it, and we may as well have shipped every penny of our allowance and chore money to Kenner headquarters. By the time 1984 had rolled around the magic was gone. There were no more movies to come out (as far as we knew) and no new characters. What was worse, we were getting older. We were starting to spend our time on more mature pursuits. The same girls we would have trampled over to get to a new figure only a year or two earlier suddenly seemed way more interesting for some reason. The party was over. Kenner kept fighting the good fight for a little while longer, but by the mid-1980s most kids, like me, had moved on. Well, temporarily, anyway. 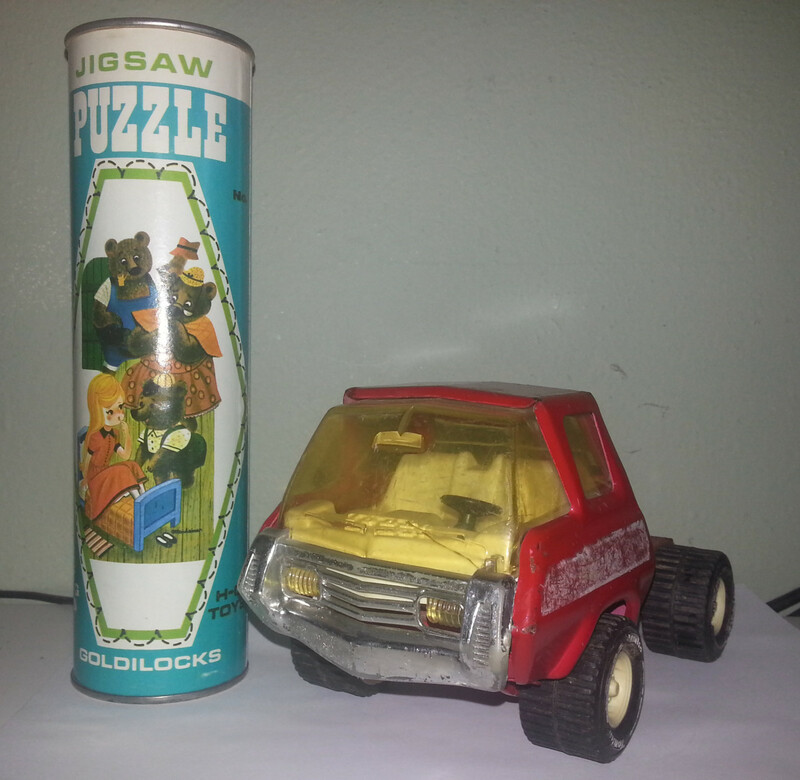 I wasn't one of those kids who strapped firecrackers onto my toys or buried them or painted them. 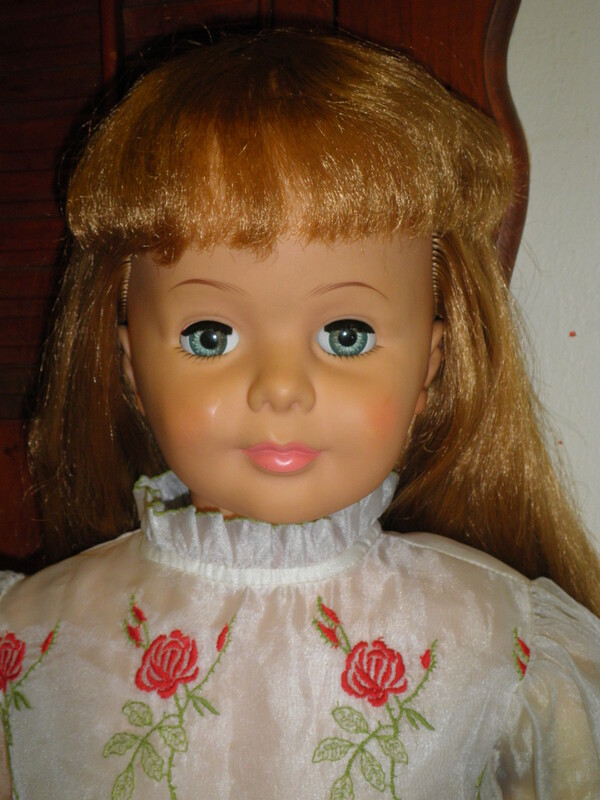 I took care of them, at least as well as a kid could, and when I got a little older my parents convinced me to pack them away because they might be worth something some day. Today, I still have all of my Star Wars action figures, which turns out to be almost the whole collection of the original figures released from 1977-1985. Some of them don't look too bad. I recently cleaned them up with the idea of seeing what they are worth and maybe selling them, a ritual I go through every ten years or so before packing them up again. However, this time I decided I don't care what they are worth. Maybe I'd get a few dollars for them if I sold them, but I doubt it would be enough to part with the memories. Instead, I'm writing this article, so folks who were around for the original Star Wars boom can walk down memory lane with me. If you're too young to know these figures, maybe you'll learn something. Here are the original 12 Star Wars 3 3/4-inch action figures. 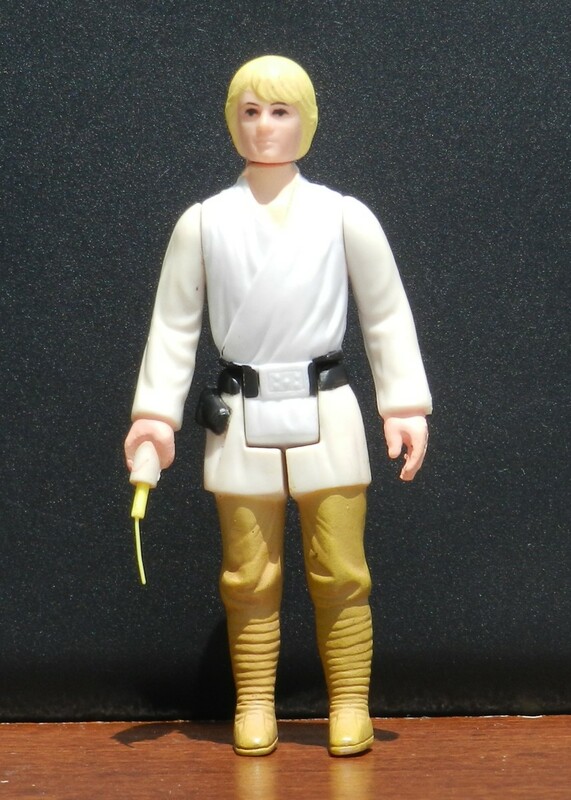 The Luke Skywalker action figure was part of an "Early Bird" marketing campaign unleashed by Kenner for Christmas 1977. There were four figures: Luke Skywalker, Princess Leia, Chewbacca and R2-D2, and by mailing in the Early Bird Certificate parents could at least have the promise of figures under the tree by Christmas. 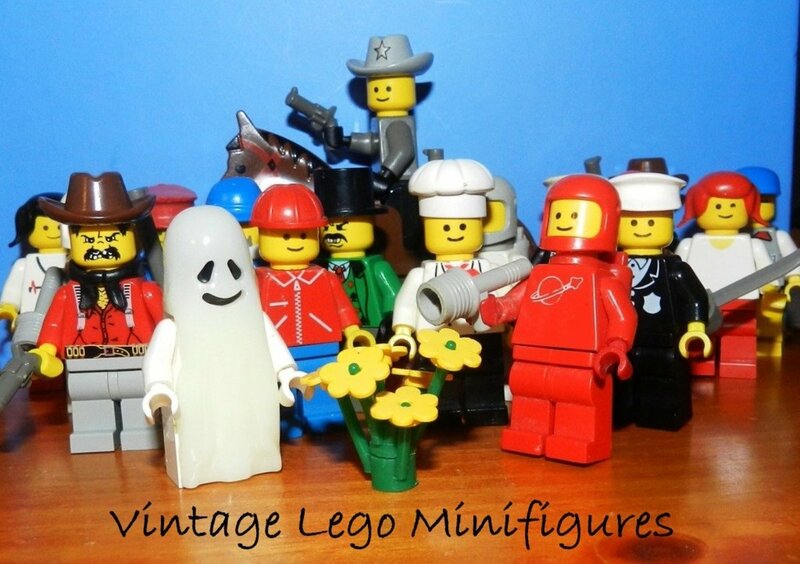 Even though the figures are stamped 1977, they were not available until later in 1978. The Luke that came with the Early Bird Kit had a double-telescoping lightsaber, and he's worth big dollars today. My figure is a later version, but not too much later. I don't think this was my original Luke, but it would have been an early one. Aside from some slightly discolored arms he's not in bad shape. The Han Solo character from Star Wars was a pretty cocky guy and thought quite a lot of himself. You may even say he had a big head. Maybe that's why they changed the head on his action figure. 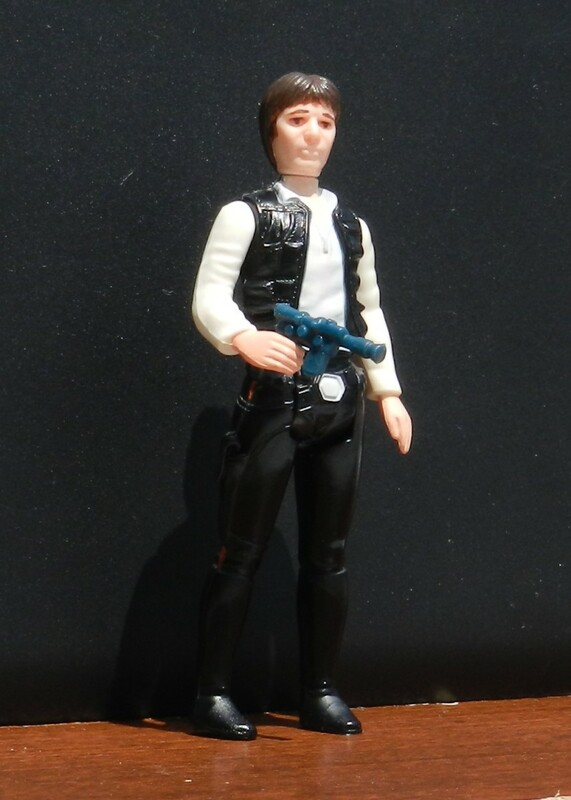 The first Han Solo action figure had a smaller head, but the one pictured here is the latter version. They are known in the action figure world as Small-head Han and Big-Head Han. I recall having the small-head version at one point and being stumped as to why they changed his appearance. Whatever the reason, Kenner would never tell. Also note the bluish color of his blaster pistol in the picture. I believe that came from a special accessories replacement pack available by "proof of purchase" mail-away, and was not original to the figure. Leia was the female hero of the movie who never missed a Stormtrooper when she shot. 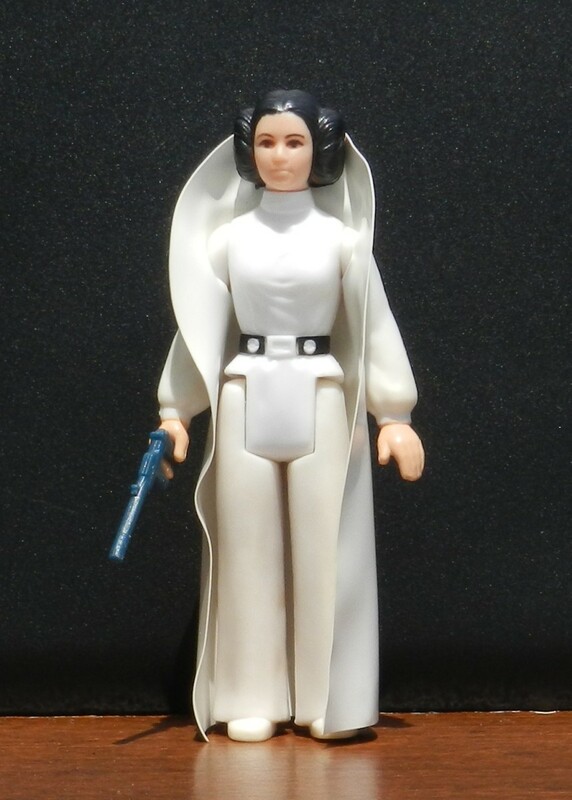 Another all-white figure, except for a little darkness to the legs she cleaned up pretty well. You can see that her blaster has a blue tinge and is probably from the accessory pack. With figures wearing the vinyl capes like Leia, Ben and Vader the cape often became damaged and destroyed through play, which makes me think this probably isn't my original figure. But several versions of Leia were released with each movie, so this one would have gotten some well-deserved rest after Empire came out. Notice anything sad about my Darth Vader figure? Yeah, he's missing the tip of his lightsaber. It really bummed be out when I pulled him out of storage and saw this. I sometimes think Kenner made the lightsabers with that wimpy tip on the end so kids would have to go out and get a new figure when it inevitably fell off. More likely it was a remnant of the "telescoping" design originally intended for Darth Vader, Luke and Obi Wan. Later figures, notably Luke Skywalker figures, would have hand-held lightsabers, which would become lost instead of broken. 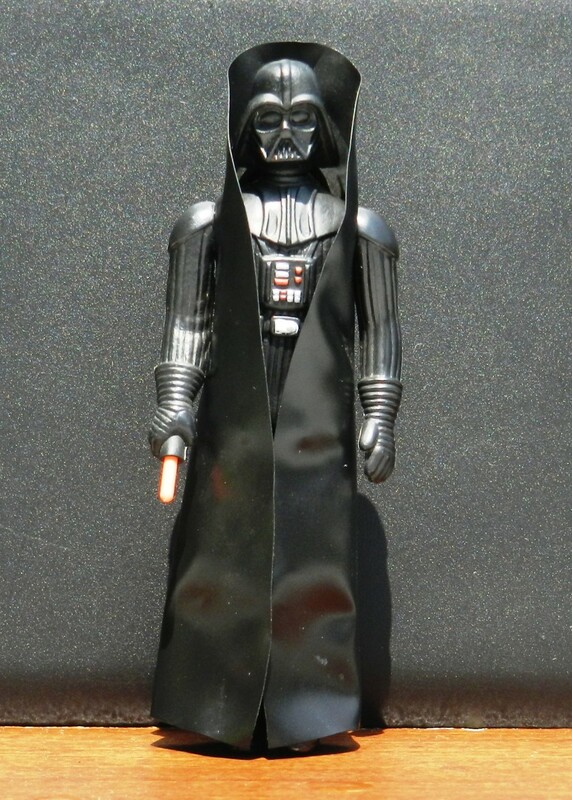 But this was the only Darth Vader action figure produced back then, and the same figure appeared on Star Wars, Empire Strikes Back and Return of the Jedi cards. I'm thinking maybe I'll look into getting a reproduction lightsaber so Vader doesn't look so pathetic! Yeah, Chewbacca's gun is missing. He's supposed to have a weapon that looks sort of like his bowcaster from the movie, and clips on his arm. Gone, and along with Vader's broken lightsaber these are the things I'm most unhappy about in this collection. But the figure itself doesn't look bad, and like the broken lightsaber I may see if I can find a reproduction weapon somewhere. One thing I chuckle about when it comes to my Star Wars action figure memories is the extreme joy of finding a lost weapon. You looked for it everywhere, finally gave up and accepted that it was sucked into the vacuum cleaner or something, and then when it turned up it was like you'd won the lottery! One of the things I recall happening to C-3PO figures was that the limbs would weaken over time, especially if you posed the figure a lot. This would make the articulation points extremely loose, and the figure might even have trouble standing. Except for the right arm, that hasn't happened to this guy. And, as you can see, he's still pretty shiny. To a kid, C-3PO was pretty boring, but I can see now how he's one of the best-looking figures of the original Star Wars action figure lineup. R2-D2 has held up fairly well considering the silver-painted plastic on his head. I have the R2-D2 from Empire Strikes Back with the retractable periscope too, and he's all tarnished on his head. This guy's stickers are a little grayed and faded, but otherwise not bad. R2-D2 and C-3PO were not only intregal to the Star Wars plot line, they were also the comedic relief. One of the early vehicles in the Kenner Star Wars toy line was Luke's landspeeder, which featured a mechanism for attaching the droids to the back, sort of like in the movie but not quite. 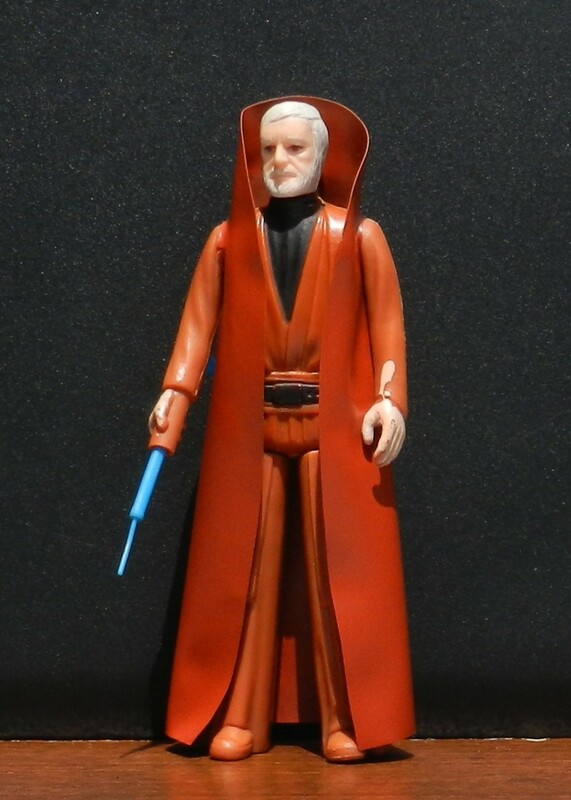 I recall Obi Wan figures with white hair, and those with gray hair. I don't know if one is worth more than the other. Note the spilled paint on his sleeve. That was a production error, not something I did as an artistic child. Honest. Like Vader, Ben appears in very similar states on Star Wars, Emipire Strikes Back and Return of the Jedi cards, except for the hair thing, and very rare early versions with a double-telescoping lightsaber. In marketing photos of the day, especially when it came to playsets, Kenner always showed a bunch of Stormtrooper figures. Apparently, maybe some kids got the idea that they needed to collect a dozen Stormtroopers to accurately recreate scenes from the movie. I never fell for that. But I did end up with two Stormtroopers somehow, and this is the better looking of the two. The arms and legs show some discoloration, but not bad. The torso is almost perfect, and the weapon is correct. 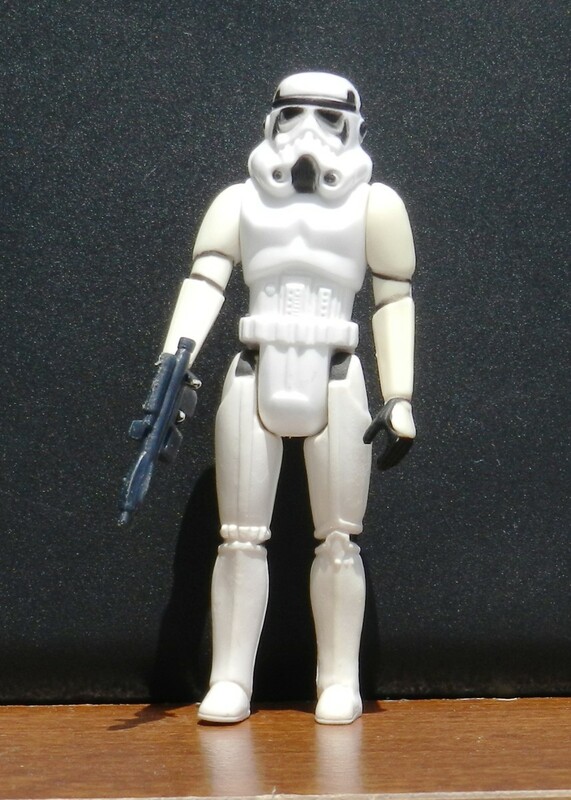 My other Stormtrooper is the opposite: Arms and legs look okay, but torso is very yellowed. Who knows what the difference is? When the original 12 Star Wars action figures hit the stores in 1978 one figure was very hard to find: The Jawa. My little friends and I were stumped as to why it was nowhere to be seen, as were our parents. There was speculation that there were production issues, and that turned out to be true. 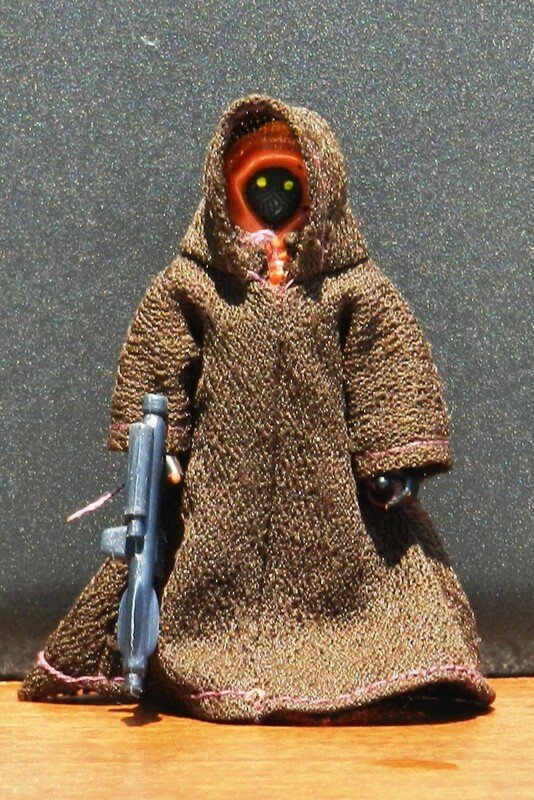 The first Jawa action figure had a vinyl cape, similar to the ones on the Darth Vader, Obi Wan and Princess Leia figures, and it was apparently giving Kenner fits. The Jawa was released soon enough with a cloth cape, and any existing vinyl-caped Jawas command thousands of dollars today. The cloth-caped Jawa pictured was my original from 1978, though I realized after shooting the picture that I've posed him with the wrong weapon. 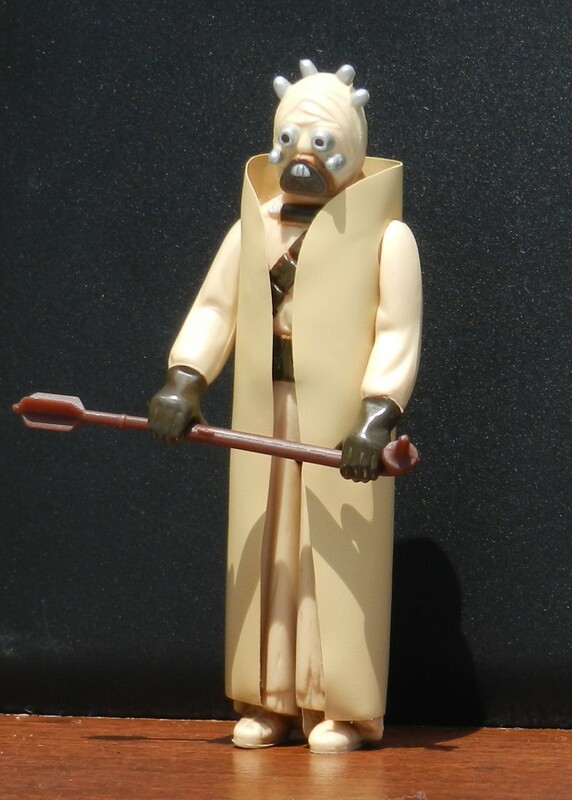 Like Chewbacca, the Sand People action figure came with a unique weapon, in this case the Gaffi Stick. I have no idea how I managed to hang onto it all of these years, but I suspect it is because the Sand People figure is the type that sits in your storage case and doesn't really come out for duty very often. Chewie, on the other hand, had all kinds of adventures and a much greater likelihood of losing his weapon. Even as a kid I thought the Death Squad Commander was an odd choice to include in the first 12 figures. 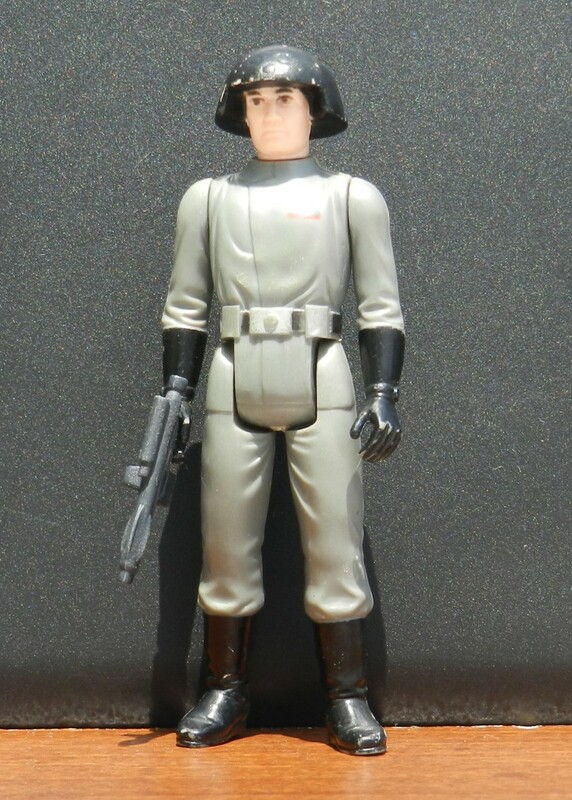 If they wanted another bad guy, it seemed logical to have Grand Moff Tarken in there, who never did get his own figure in the vintage Star Wars lineup. 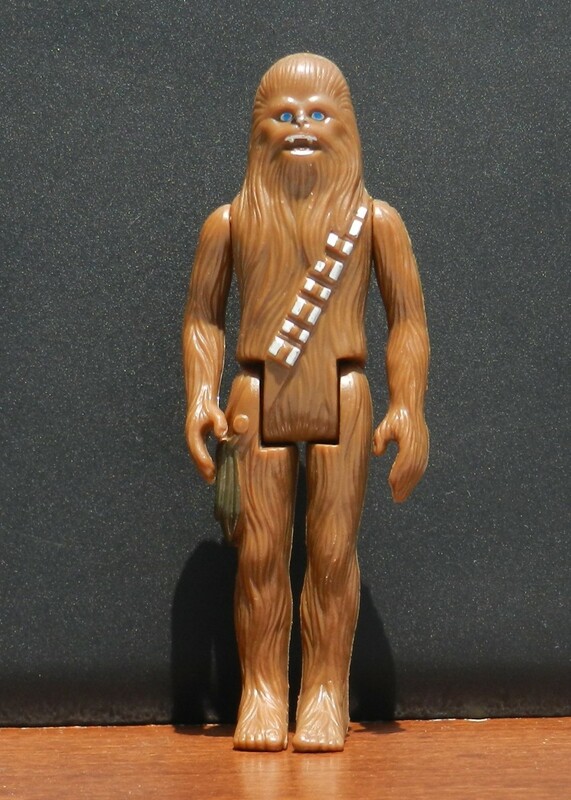 This is an original figure from 1978, and one of the most boring in the Star Wars action figure lineup. Still, if you had the Death Star playset, I guess you needed someone to fire that huge laser. This figure was later renamed Star Destroyer Commander. Apparently the concept of a "Death Squad" may have been too intense even for the Empire. Cleaning up my old Star Wars action figures and doing a little research on them has been a fun project. My next job will be to assemble and clean up the next group of figures that came out in 1979 as part of the 20-back cards, along with the notorious Boba Fett, who was originally acquired via a special mail-away opportunity. If you have some Star Wars action figures stashed away somewhere, why not pull them out and clean them up? Following some advice I found online, I just used some dish detergent, hot water and a soft-bristled toothbrush. If you're knowledgeable about Star Wars figures, and you spot some errors here or have some interesting thoughts about my collection, feel free to let me know in the comments. I'd appreciate any advice, and I sure don't know a whole lot about these things. Hope you enjoyed this trip back through my childhood, and a look at the original 12 Kenner Star Wars action figures. 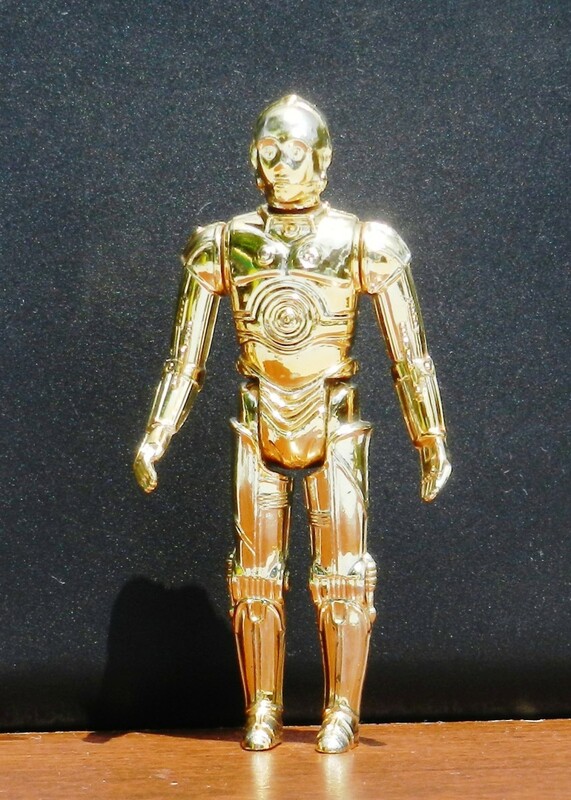 Wow, your C3PO is still so shiny. You really take care of your toys. Oh how I wish I still had some of those original figures! Congrats on HOTD. Enjoyed the article. Need to dig out my son's old action figures. @M.T. Dremer: I have many of those POTF figures from '95 as well. I collected them all and kept them on their cards up until Episode 1 came out. Then I started collecting the figures from the movie for a while before I realized I was getting out of control! I sold them off but kept a bunch of loose figures. The only one I still have MOC is Boba Fett. 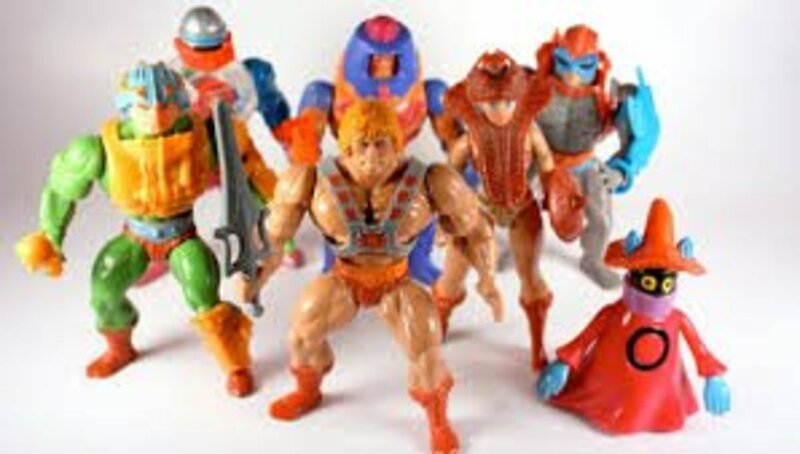 Those were cool figures, even though they looked they like they spent a lot more time in the gym than the originals! Thanks for the kind comments everyone, and thanks HP for Hub of the Day! Glad to see so many people remember the Star Wars figures as fondly as I do! 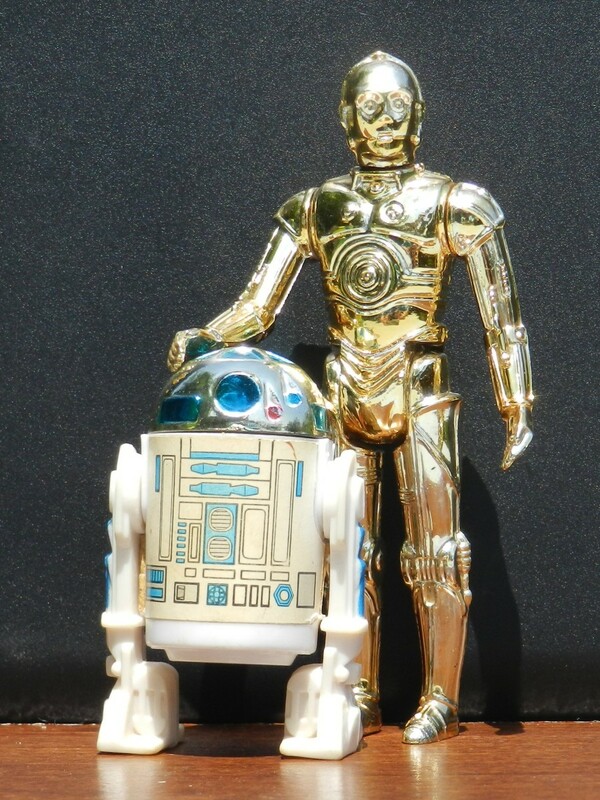 That C-3PO and R2-D2 were two of my childhood favorites. I used to play with them while listening to the Star Wars soundtrack album. 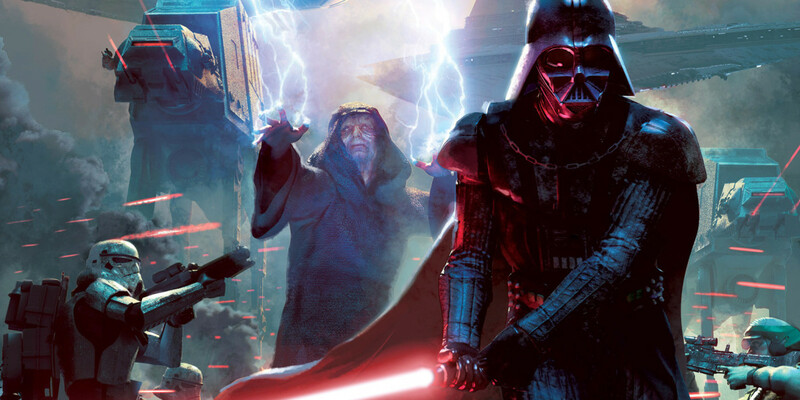 I had forgotten about Darth Vader until I saw this photo and instantly remembered the texture of that plastic cape. Thanks for the memories! Super hero movies are so common today, but back then I remember standing in lines to be among to see the Star Wars series. I'm glad you kept the figures. Great Hub. This was very cool for me, because I also grew up on Star Wars movies and toys. I used to have (pretend) light-saber battles with friends. To me, your collection looks fantastic. I don't know what happened to any of my old Star Wars action figures, sort of wish I still had them. Love the collection!! My dad refurbished the 1979 Millennium Falcon for my son last Christmas. I'm not sure who loved it more him or me. Salvador: I so agree about the memories. I think its hard for kids today to even imagine how huge Star Wars was back then. There are big movies today, but they explode for a few months and then the next thing comes along. Star Wars just dominated everything for a good six or seven years, at least if you were a kid. I've been thinking about that a lot since I wrote this post. Its all about the memories that are connected to the figures . I am only missing blue snaggletooth and yak face I have all my figures in a display case in the living room . My kids love the figures . Every time I look at the figures I remember holding my mother's hand at the ticket window buying the movie tickets to see the first star wars movie :) those where the days . @ Sheila: I remember the Millennium Falcon and the Darth Vader case. Ah, the stuff I wish I still had around. 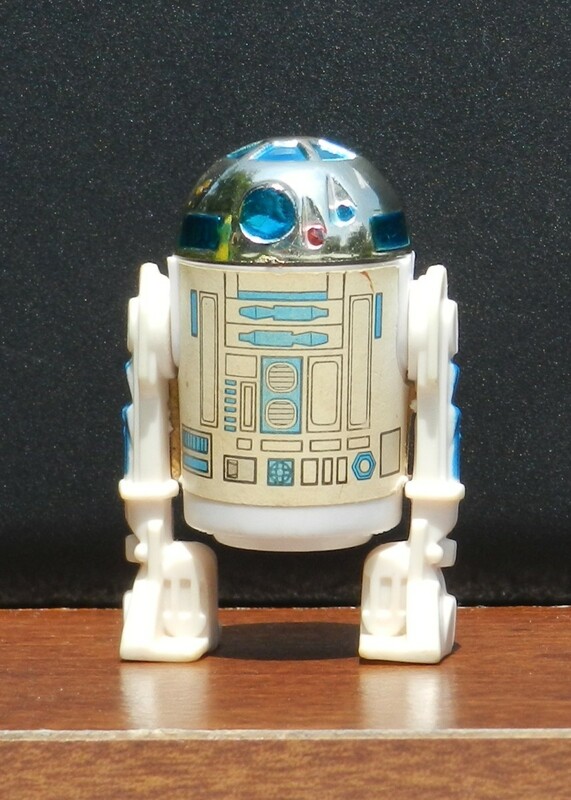 @FFCat: R5-D4 and Power Droid (Gonk!) are part of the next series I need to clean up. I think Kenner knew no matter what they put out we'd have to have it! Very cool collection, brought back some memories. My brother and I had an impressive collection of Star Wars figures as well... we were so obsessed that we even had figures of useless background characters like the Power Droid and R5-D4 (the orange colored droid who "has a bad motivator")!! Thanks for the trip down memory lane. My brother had all of these and I remember days when we played with them all day long. He stored them in the Darth Vader carrier and had the huge Millennium Falcon. @Geekdom: Those were good days, for sure. @Trisha: No crime in never seeing Star Wars, at least not until I'm president. :-) Thanks for the kind words.